Kensington Palace on Thursday released the couple’s engagement photos, and royal watchers went bananas. Here’s every little thing you could possibly want to know about these images. Finally. No grainy paparazzi photos. No having to analyze the simple gestures they made while announcing their upcoming nuptials. The public finally has some up-close-and-personal, mushy and romantic Meghan Markle and Prince Harry photos to pore over. The photos were taken earlier this week at Frogmore House, Windsor — the same week that the “Suits” actress joined Prince Harry for the royal family’s Christmas luncheon at Buckingham Palace. 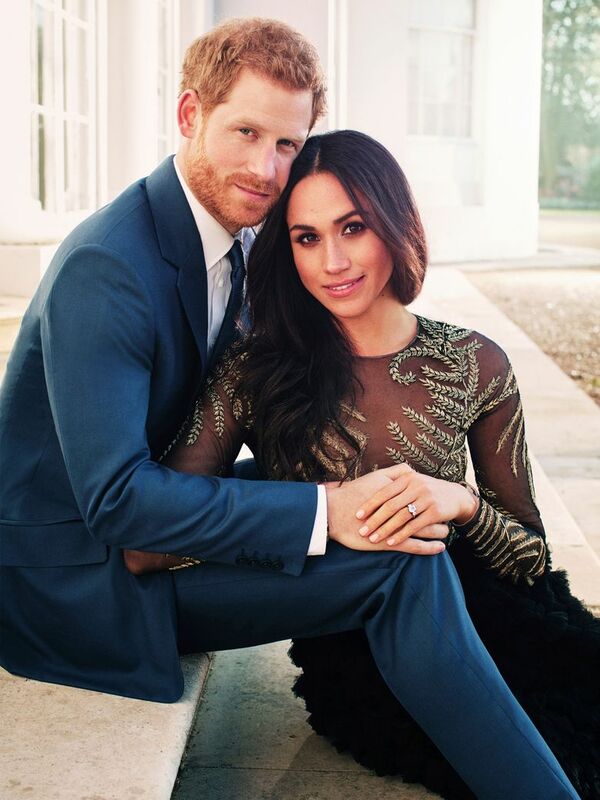 Prince Harry and Markle will marry on May 19 at St. George’s Chapel at Windsor Castle, which is a more intimate space than Westminster Abbey, where other recent royal weddings have taken place. The wedding will “reflect their characters and personalities,” the palace said in a statement. Can we talk about wardrobe choices? Yeah, so Prince Harry is wearing a suit and tie. Cool. But Markle’s clothes immediately stand out. I mean, I’m no professional fashion critic, but her dress and its sheer-looking black top with gold trim is quite a bold choice for royal portraiture. The look is stunning and elegant but certainly doesn’t send any stuffy, traditional signals. Perhaps it’s fitting, as Markle is certainly not a cookie-cutter royal fiancee; she’s American, mixed-race and divorced. The dress comes from British fashion house Ralph & Russo, the Guardian reports; the couture brand is the only British one to show at Paris Haute Couture Week. As far the sweater in the close-up shot, its origins are a little murkier; rumors that it could be a Victoria Beckham design haven’t been confirmed. Celebrity and fashion photographer Alexi Lubomirski, whose work frequently appears in the pages of Vogue magazines around the world, was the guy behind the lens. According to his website, he’s photographed a slew of famous women, from Beyoncé to Julia Roberts. Lubomirski spent four years as an assistant to Mario Testino, the famed fashion photographer who took the engagement photos of Prince Harry’s brother, Prince William and Kate Middleton. (Testino also took iconic photos of Princess Diana). 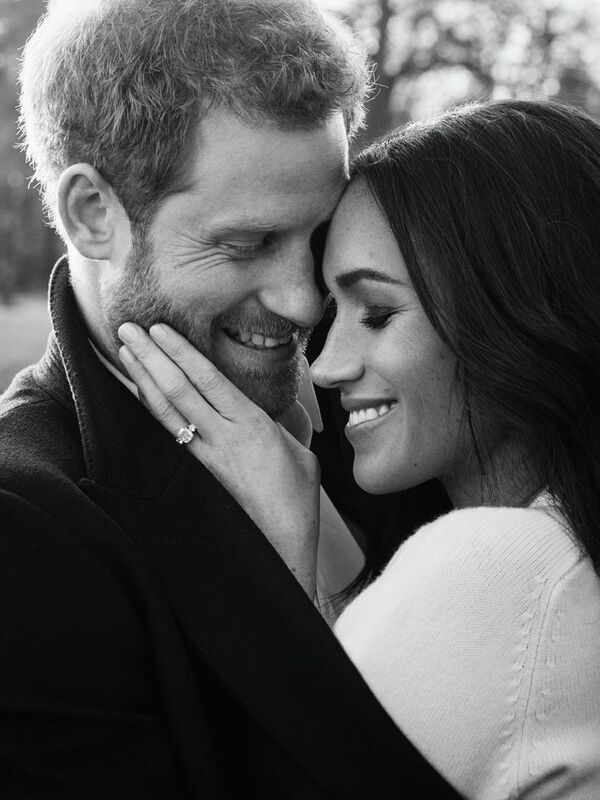 How do these compare to past royal engagement photos? Releasing engagement photos to big fanfare is nothing new for the royal family. In December 2010, Prince William and Kate Middleton released their own pair of engagement portraits, which were shot by Testino at St. James’s Palace in London. Both of those photos appeared to have been taken indoors. The more formal photo featured William in a suit and Kate in a simple white dress. The second photo showed the couple in a tight embrace, sporting giant smiles as their heads touched. Middleton’s engagement ring, which once belonged to Princess Diana, immediately stood out. The image also had echoes of the informal 1981 engagement photo of Prince Charles and Princess Diana, which featured the royal couple with big smiles. Prince Charles was in a button-up shirt and sitting as Diana, in a denim shirt, hugged him from behind.